Color: Yellow, Green, Red etc. Our customers can avail from us an excellent quality range of Soccer Shin Guards. These Soccer Shin Guards are available in various sizes and specifications. Our Soccer Shin Guards can be customized as per our customers specifications and it can be availed at most reasonable price. Owing to our rich industry experience, we introduce an exclusive range of premium quality Soccer Equipments to our clients. Our company offers soccer balls according to the soccer authority’s weights and sizes. The range of soccer equipment is available in various designs and patterns that are procured from reliable vendors. - 4 mm Foam backing for shock absorption. - Soccer kich man size is of 6'x2' (HXW) strong construction. - Spiked weighted base for in ground insertion. 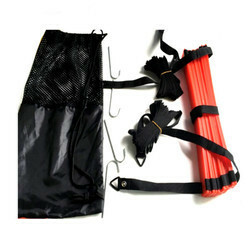 Dummies for Penalty Training made of steel tube with 2 or 4 legs, Mesh frame or Heavy Duty Nylon Cover in middle & 4 steel pegs to insert into ground for holding the dummy. 180 cm high with 4 legs & mesh frame in middle. 54951 160 cm high with 4 legs & mesh frame in middle. We are one of the distinguished leaders in supplying & exporting of quality assured Soccer equipment, Soccer gear, Soccer balls, Marking cones, portable Soccer goals etc. - ONE 12 ft x 6 ft GOAL - Instant portable collapsible soccer net. Metal base frame with fiberglass vertical bow style poles. Includes 1 portable 12 foot by 6 foot goal, ground stakes, bungee and 1 carry bag with shoulder straps. Heavy-duty zipper storage bag. - EASY QUICK SETUP - Goals setup in minutes. No tools required. - S shape net clips made up of light weight but durable plastic. - Its time saving method of attaching net to goal post. - Available in different color like Red, Yellow, Blue, White, Orange, Black etc. - Customized packing of 25 or 40 etc.. also available in bulk quantity. 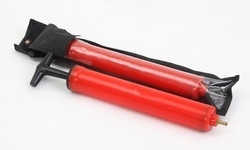 Made of 20 mm PVC pipe with 8mm spike inbottom ends. Ideal training tool to improveyour passing & shooting skills.